If you are an iPad user, you will agree to the fact that there are simply innumerable files that you keep storing in it. However, if you are one of those who want to sell you iPad to get a newer version, you might already be starting to get worried about how to delete all files from iPad. Or perhaps it is because you are worried about security in terms of having your private files being hacked by someone. In this case, you might even to get rid of the private files that you deleted in the normal way. Moreover, some may also consider completely wiping iPads to improve its performance. Nevertheless, it is always a good idea to keep checking your storage usage. This way you can keep track of all the unnecessary files that are taking up a lot of space. You can then delete such files from iPad on an ongoing basis if you think you do not need them anymore. In order to see how much space you have used and how much is left, you can go to the Settings app on your iPad. Tap Settings > General > Usage to see all the details. You can also know how much space is each app consuming. 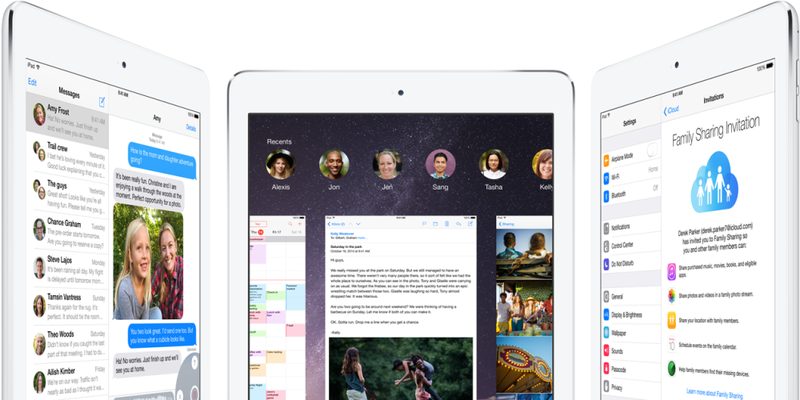 How to Delete Different Types of Files from iPad? Well, you can start by getting rid of all the junk and temporary files. Such files have no use and simply come in your way whenever you want to store something else. You can delete junk files from iPad by going to the Settings app. Tap “Settings” and then go to “Safari”. From there tap “Clear History and Website Data”. This will allow you to get rid of most of the temporary and junk files that have accumulated as a result of using Safari. Another way is to erase large files that you no longer use. These may include some old photos and videos. Such files take up a lot of space and you can back them up before deleting them from your iPad so that you do not lose them. To delete photos and videos, you can do so by going go the photos and videos app respectively to delete the files individually. You may also consider removing certain apps that are using a lot of space. To uninstall Apps is very simple, you just need to press the App you want to delete, and tap "×" when it appears. In addition, you may also want to remove the files that you recently deleted. The files that you delete may be recovered through some data recovery software and hence it is recommended to get rid of these files completely. A good software that can help you do this is iMyFone Umate Pro. iMyFone Umate iPhone Cleaner or iMyFone Umate iPhone Cleaner for mac is the perfect solution to all your problems. It is a very effective data erasing tool that lets you delete files in a number of ways. It has four cleaning modes and each one of them is mentioned below. One-click Clean-up: This feature allows you to easily increase storage space by letting you delete redundant junk and temporary files. Deletion for junk and temporary files is free, you do not need to pay for it. 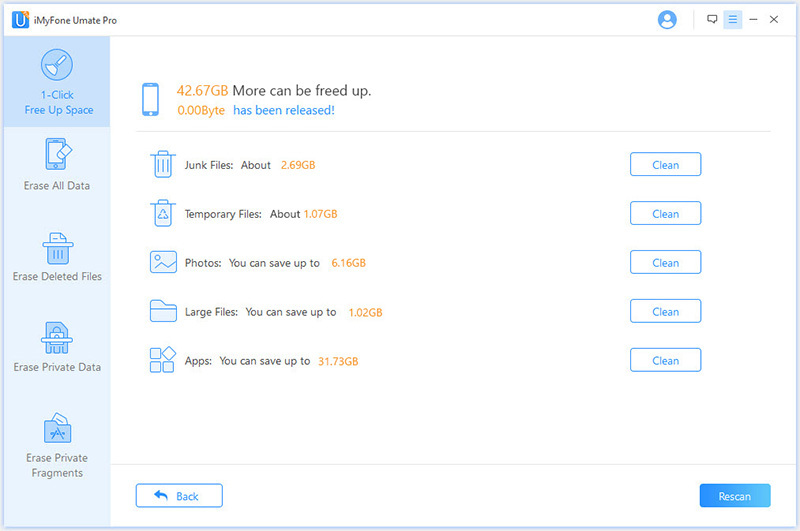 You can also compress photos and videos to save space and delete multiple Apps in one go without having to go through the trouble of removing files manually from your iPad. Erase All Data: As the name suggests, with this option, you can completely erase your iPad by getting rid of all the files and making your device seem as if it were brand new. No one can recovery these erased files, even if they have the most modern recovery software. 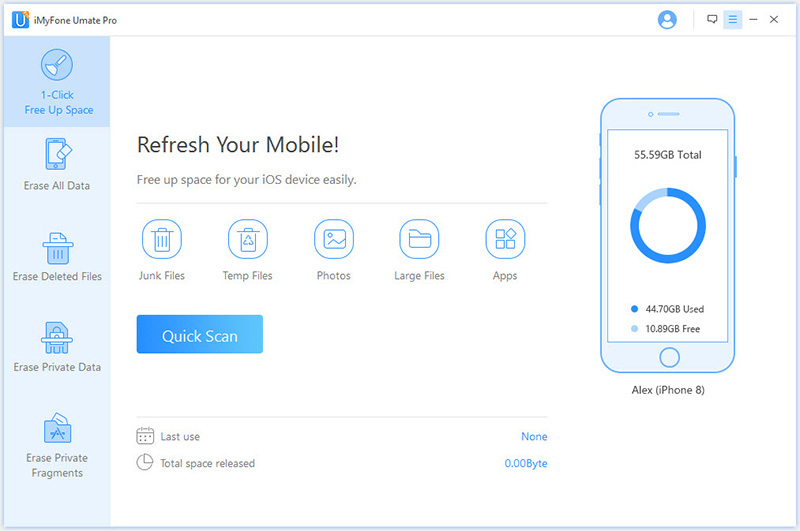 Erase Private Data: Erase Private Data: Compared with iPad “Factory Reset”, this is the advantages of using iMyFone Umate Pro, it lets you select files individually that you want to erase. This means you can select the files that you think are private and erase so as to keep your privacy secure and safe. 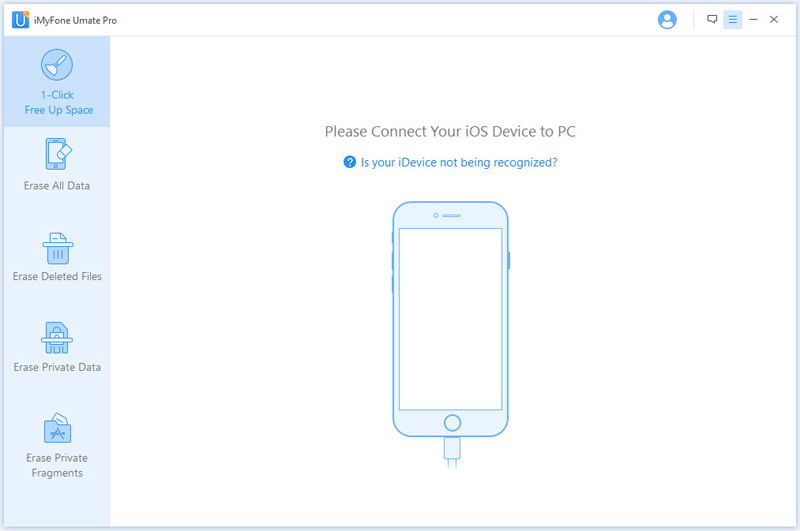 Step 1: Connect your device to your computer and launch iMyFone Umate Pro. Step 2: Select the option that you want, take one-click cleanup for example, then click “Quick Scan”. Step 3: After that, you can see all the files that can be deleted. And you just need to click “Clean” button to begin the process of deleting files from iPad.